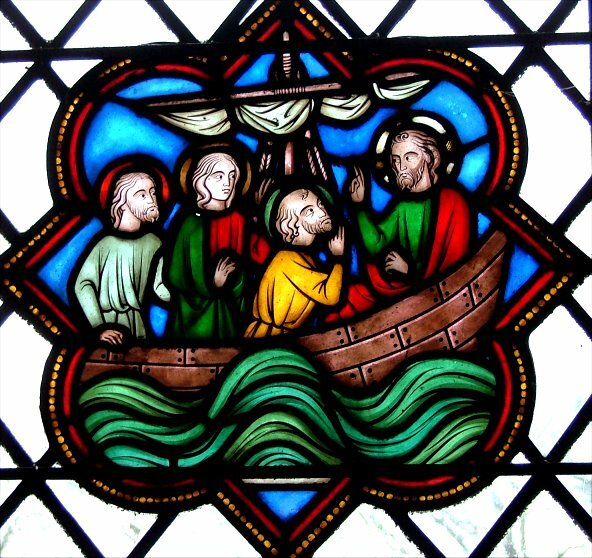 The reorganisation of Norfolk parishes into group benefices has helped secure the future of churches that might have been made redundant thirty years ago. 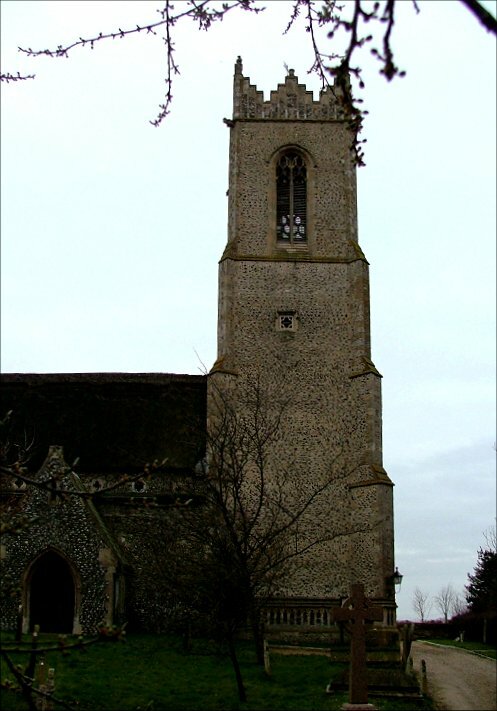 Filby, famously, is part of the Spies group of parishes, along with neighbouring villages Burgess and Maclean. 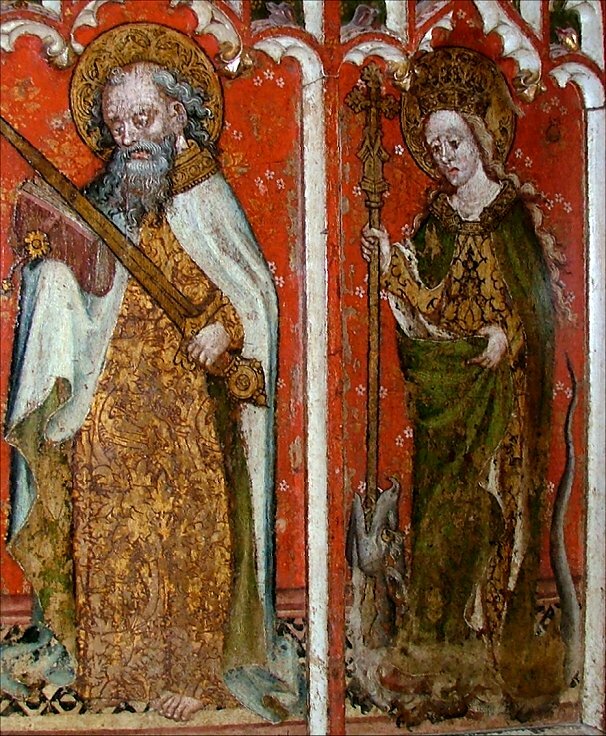 In more recent times the parish of Blunt was added to the group, and there's a fifth member too, but nobody seems to agree on which it is. Not really, of course. 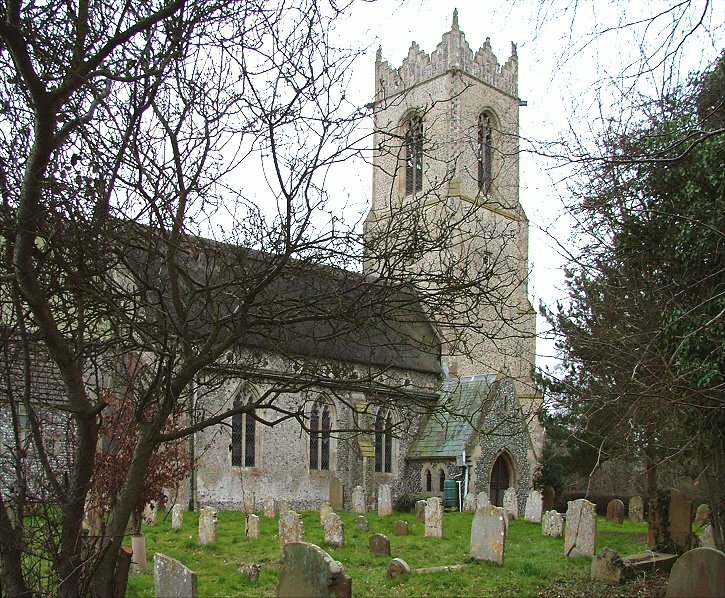 And the future of Filby was never in doubt, because this is a large, lively village, virtually a suburb of Caister. The church is a big one, and it sits in the fields to the south of the main street. If it isn't open, the key is at the post office. 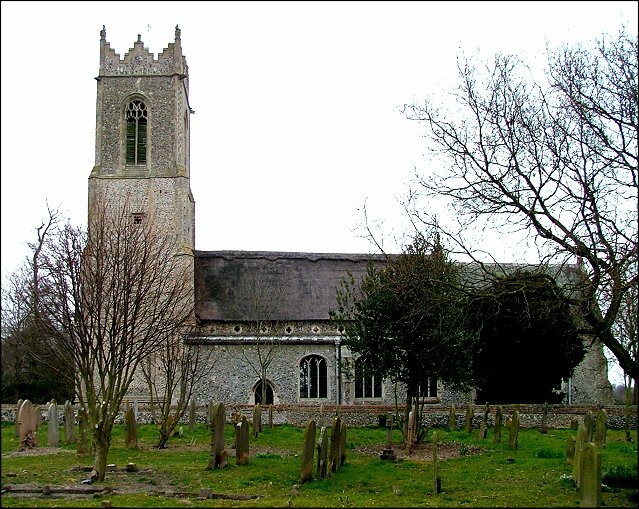 This area of Norse placenames is known as the Flegg, and there seems to have been plenty of money about in this part of Norfolk in the last quarter of the 19th century. 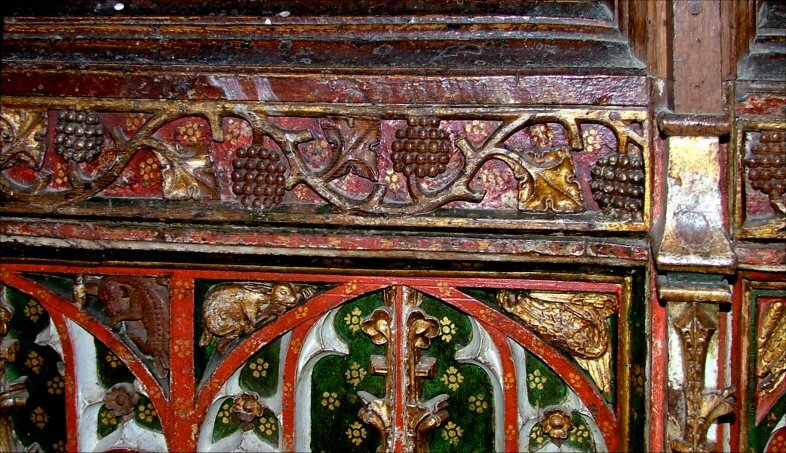 This has resulted in some massive restorations, either from the plans, or under the watchful eye, of Herbert Green, Diocesan architect. 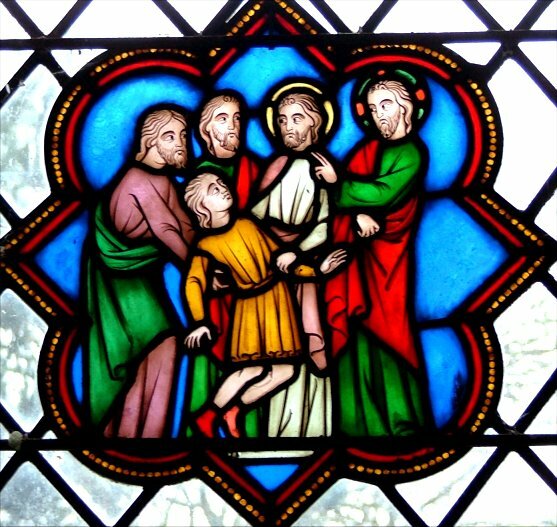 Generally, the results are both good and bad; some churches have marvellous glass, especially from the 1880-1930 period, but the interiors of the buildings are generally dour, and scoured of any character. These qualities are certainly apparent at Filby. 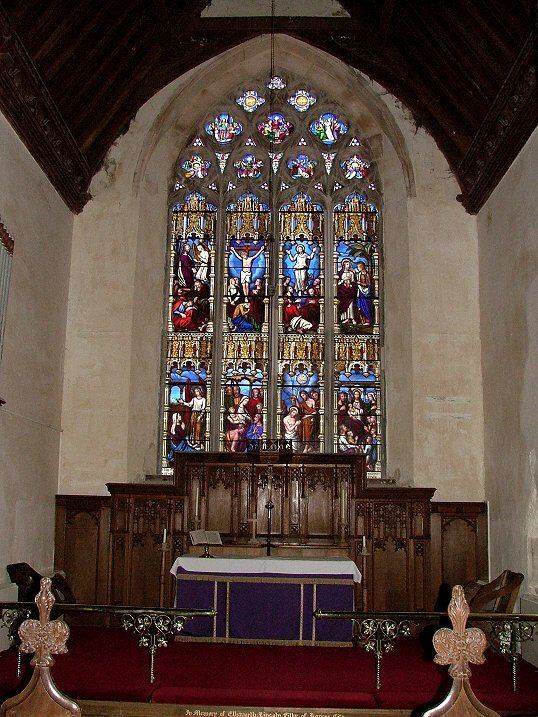 With one glorious exception, there is an anonymity to the interior, which is a pity, because the exterior is pleasing, despite the replacement windows. 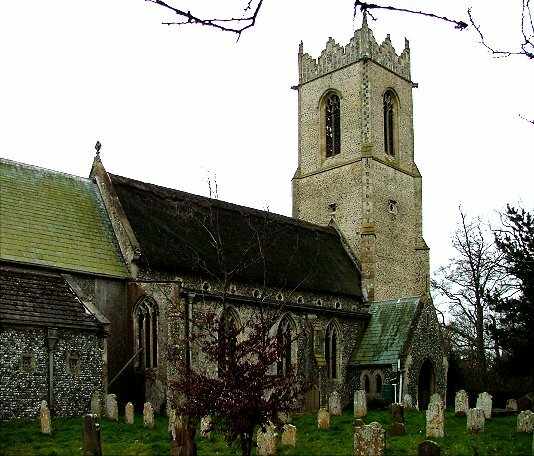 There is a grandness softened by the thatch of the nave, and the clerestory peeping above the aisle is a fine Early English moment. 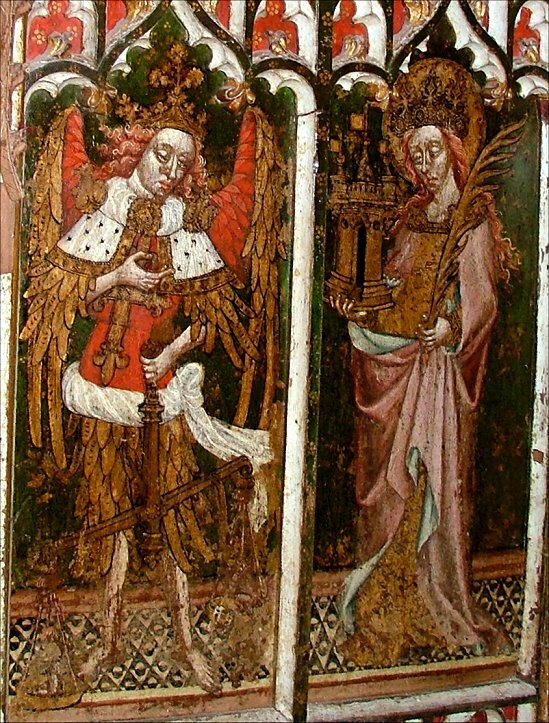 The saving grace, and it is a great one, is apparent the moment you step through the west doors, because All Saints is one of the few East Anglian churches that you enter from the west. 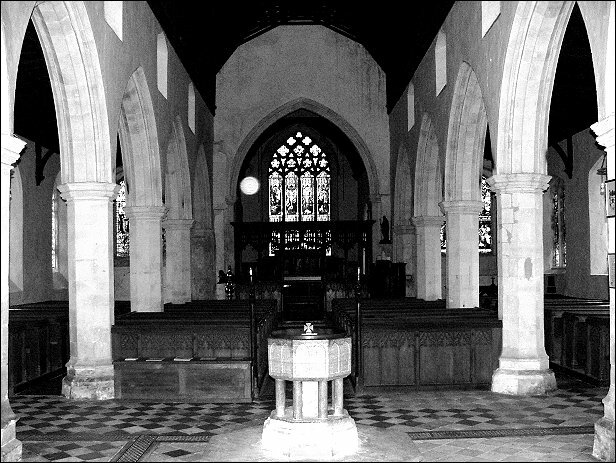 The space beneath the tower is vast, the tower arch as high as the nave roof, and it is reminiscent of stepping into Salle. 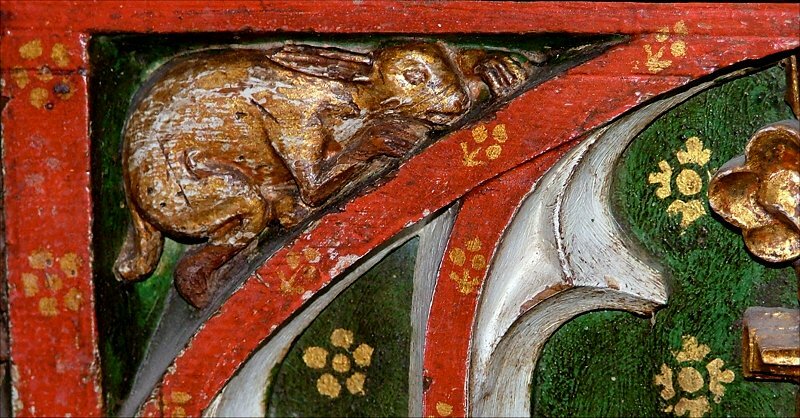 Few of the churches in the Flegg have medieval survivals of any significance; but Filby does. 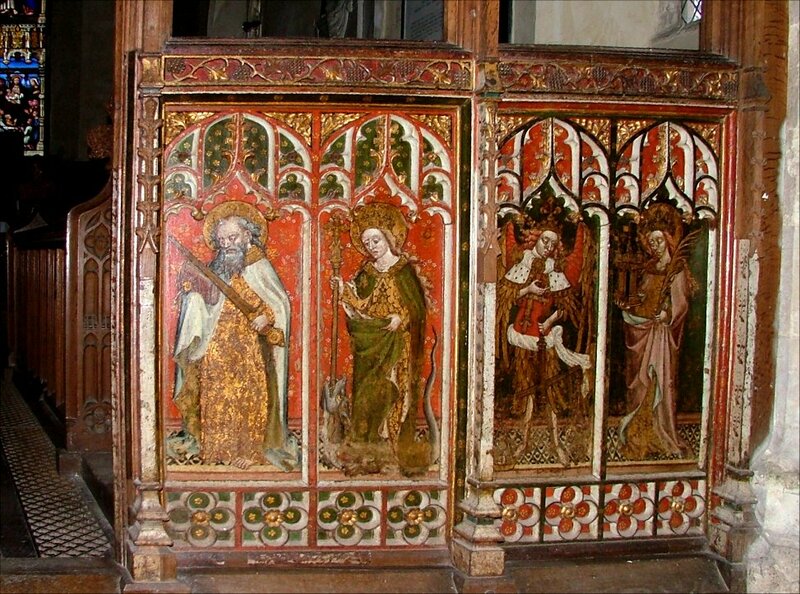 This is the area's best 15th century roodscreen dado. 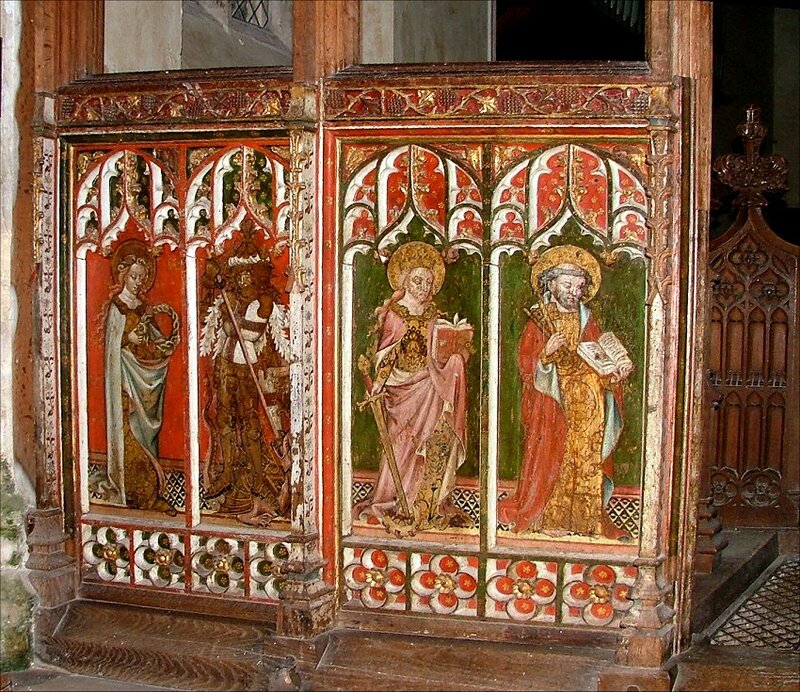 It is painted with eight figures, and they really are in excellent condition, the style strongly reminiscent of the screen at Ranworth. 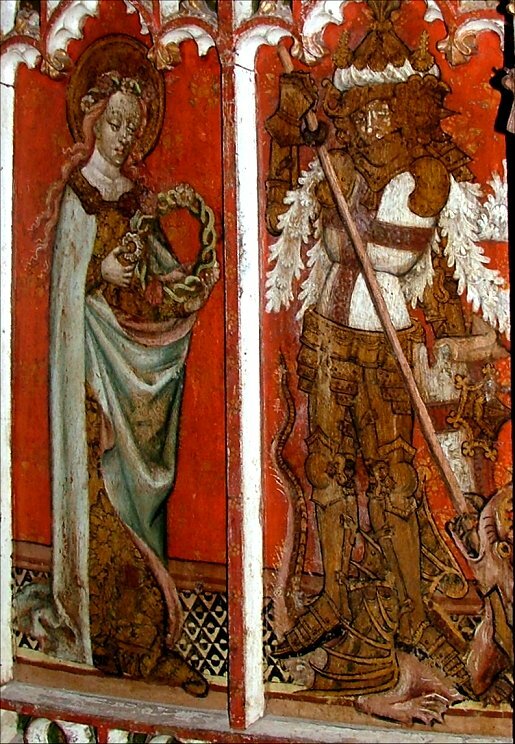 From north to south, the panels feature St Cecilia with her floral wreath, St George killing a dragon, St Catherine with her sword and wheel, St Peter with his keys, St Paul with his sword and book, St Margaret killing a dragon, St Michael weighing souls, and St Barbara holding a tower. 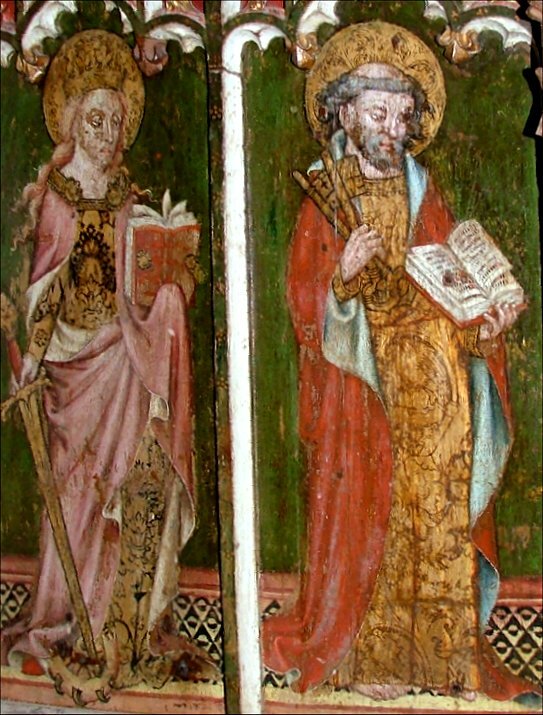 This is a textbook example of the way Saints are set in pairs across the screen, working from the outside in, thus Barbara and Cecilia, Michael and George, Margaret and Catherine, Paul and Peter. 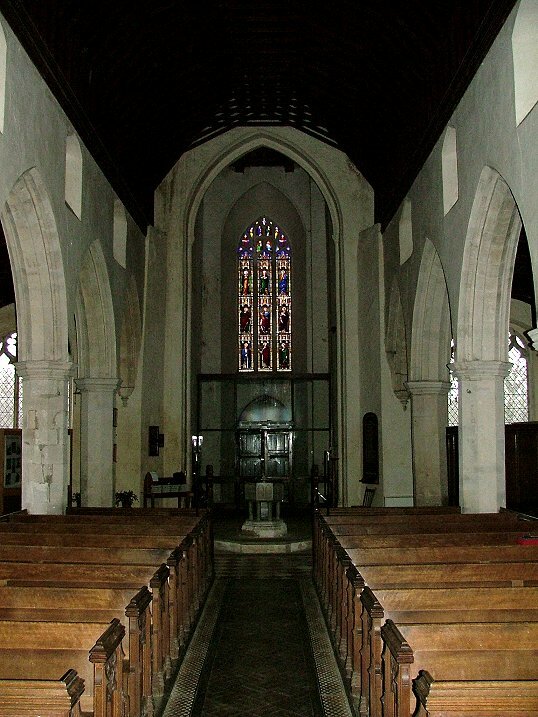 There's more good late 19th century glass in this corner of Norfolk than any other, but Filby has something special from a few years earlier. 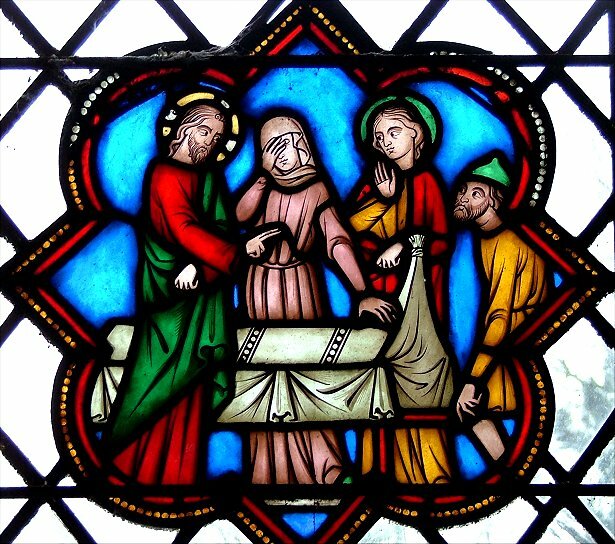 This is a sequence in the north aisle from the 1850s, of French glass in the 13th century cathedral style. 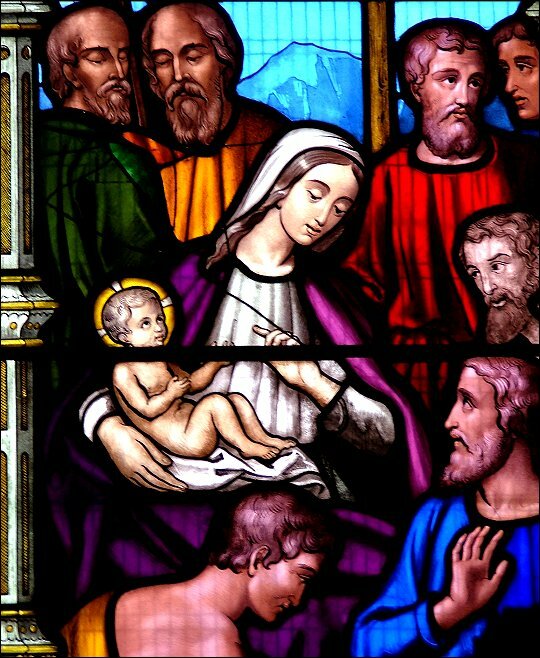 We were here quite late in the afternoon, and the glass on the south side was difficult to photograph, but this is also very good. 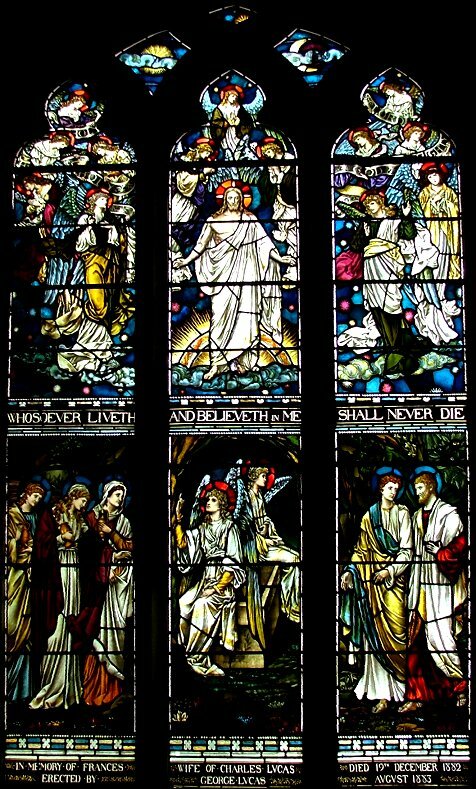 The best of all is the east window of the south aisle, featuring the women at the tomb in the lower level, and the risen Christ in the upper. 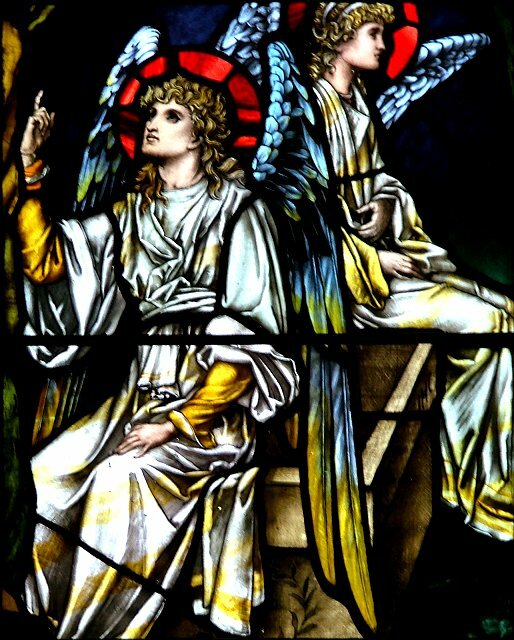 In fact, the only weakness here is in the east window of the chancel. 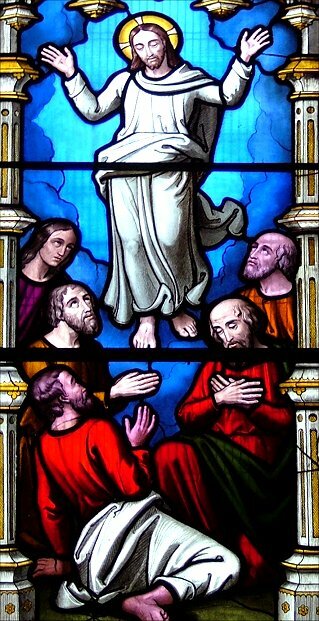 It includes one of those unfortunate 'trampolining Jesus' images of the Ascension, and the figures are more stilted. 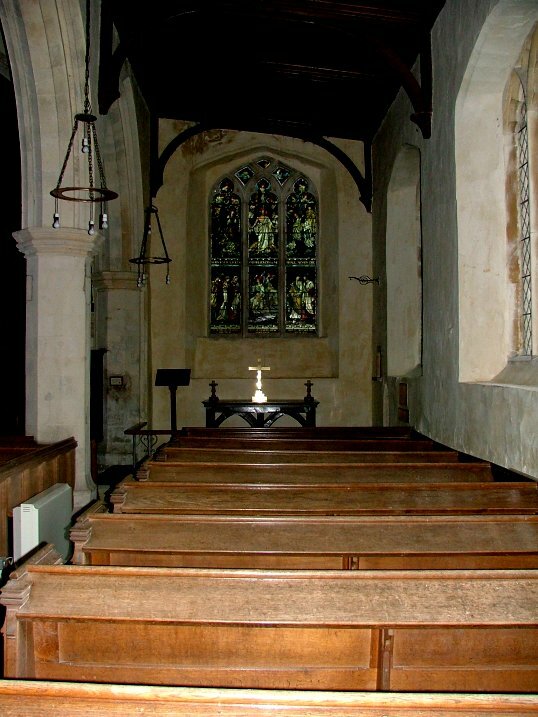 The light switches are locked away in the vestry, and so we were unable to illuminate the nave, which in its vast gloominess was rather a cold place. 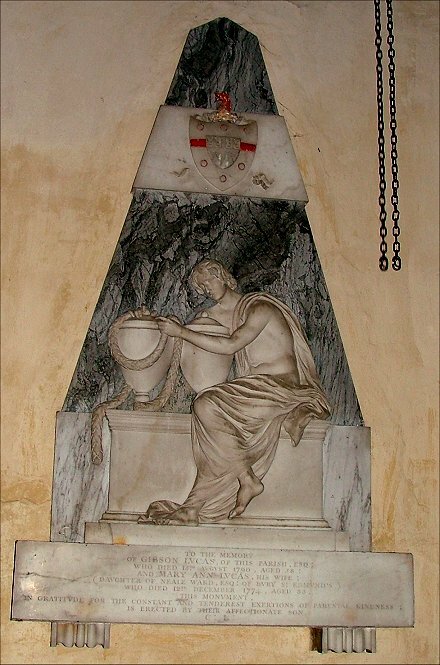 The chancel is lighter, and here are two whacking great early 19th century memorials featuring figures that are almost life-size. 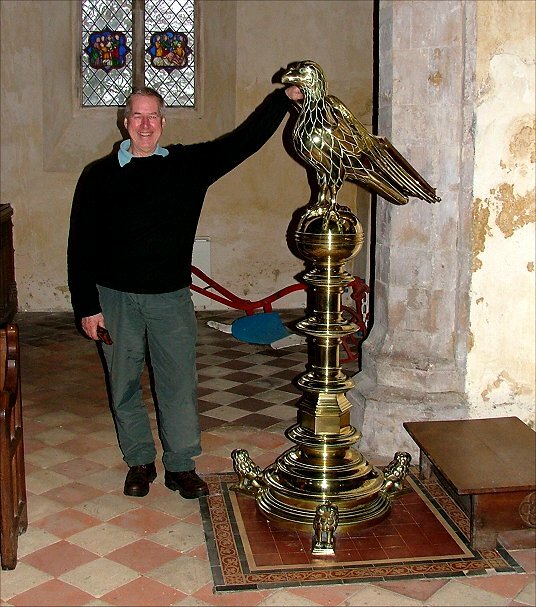 The lectern is a 19th century imitation of the great 15th century latten eagle types you find at Redenhall, Walpole St Peter and elsewhere. 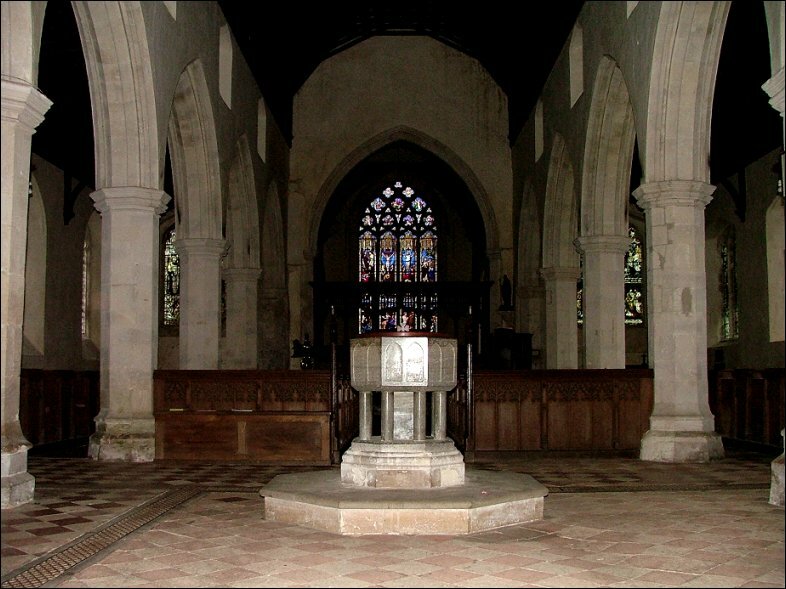 The Victorians went one better with the font, using a genuine 13th century Purbeck marble font, polishing it up and resetting it on a collonade, making the medieval look Victorian rather than the other way around. 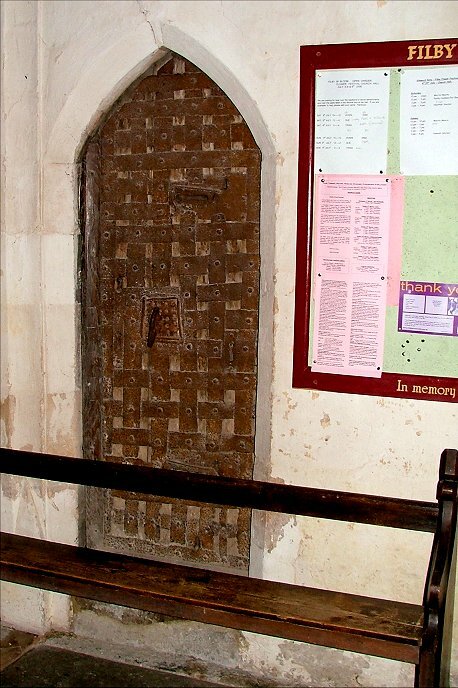 Not far off is a genuine medieval survival, the iron-banded door to the tower. You wouldn't get through that in a hurry.